Fayetteville, N.C. � One of four men charged with killing a Fort Bragg soldier outside a local nightclub two years ago pleaded guilty Tuesday to robbery charges in the case. Roy Lee Hawk, 22, of Vaughn Road in Fayetteville, pleaded guilty to four counts of robbery with a dangerous weapon and one count of conspiracy to commit robbery. He will be sentenced later, when he faces up to 84 years in prison. Sgt. Sergio Sanchez, 22, of Anniston, Ala., served as a computer-repair technician with the 82nd Airborne. He died from gunshot wounds received during a robbery outside a nightclub on April 12, 2008, less than a month after his return from Iraq. Spc. 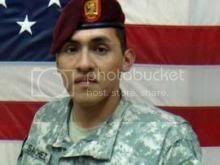 Sergio Sanchez, 22, of Anniston, Ala., was just back from a tour of duty in Iraq when he was killed outside Sharky's Cabaret on April 12, 2008. Witnesses said Sanchez was outside the club, talking on his cell phone, when he came upon several men robbing three other soldiers in a parking lot off Blue Street. They said a gunman approached Sanchez from behind and shot him in the neck at close range. Fayetteville police detectives followed up leads in Cumberland, Lee and Harnett counties for weeks until a Crime Stoppers tip led them to four men suspected of committing robberies in Sampson County. 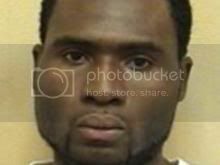 James Anthony Carr, 26, of David Park Lane in Roseboro, Jeriamiah Markee Clark, 18, of Claudes Drag Road in Roseboro, and Terrance L. Roberts, 20, of Woody Pine Lane in Salemberg, also have been charged in the case. Carr is believed to be the gunman who shot Sanchez, and prosecutors plan to seek the death penalty against him. James Anthony Carr of Sampson County was convicted of second-degree murder on March 23 for robbing four soldiers at gunpoint in Fayetteville four years ago and killing one with a shotgun blast to the neck. The murdered soldier, 22-year-old Sgt. Sergio Sanchez Jr. of the 82nd Airborne Division, had recently returned from an Iraq deployment and was talking on his cell phone with his girlfriend when he was shot. Carr, 28, was also convicted of four counts of robbery with a dangerous weapon and one count of conspiracy. He was sentenced to a minimum of 26 years, 11 months, to a maximum of 33 years, 10 months behind bars, for the robberies and murder. He gets credit for spending three years and seven months in jail awaiting trial. The conviction capped the final trial prosecuted by Assistant Cumberland County District Attorney Cal Colyer. Colyer, who handled the bulk of the county's homicide cases since the 1990s, retired Friday after nearly 30 years with the District Attorney's Office. The murder and robberies were in the early hours of April 12, 2008, outside Sharkey's Cabaret on Bragg Boulevard. Colyer said three soldiers who had been at Sharkey's were robbed at gunpoint on Blue Street near the club by a group of four men, including Carr. The robbers beat the the soldiers with a pistol, kicked and punched them, Colyer said. Records say the robbers stole the soldiers' money, cell phones, bank cards and other property. Sanchez, who was not with the three soldiers and did not know them, had spent the evening as the designated driver with friends in Kagney's, a nightclub in the same building as Sharkey's, Colyer said. Sanchez was walking toward his car while talking on his phone with his girlfriend in Pennsylvania. Carr and the other robbers, fresh from robbing the first three soldiers, accosted Sanchez. Sanchez's girlfriend heard the robbery, Colyer said. "She heard him kind of laugh and say, 'This guy wants my wallet,' and then heard someone make a couple of demands to, 'Give up your wallet,' or 'Give it up,' " Colyer said. Then the conversation went silent, he said. Carr shot Sanchez, Colyer said, and there was testimony that he emptied Sanchez's pockets. The three soldiers who had been previously robbed went to Sanchez's aid and called the police, Colyer said. Sanchez died about a week later. The crime was unsolved until a woman came forward to the police in May 2008, Colyer said. She had been the robbers' driver, he said. She was not charged. Carr's three co-conspirators, Terrance Lee Roberts of Sampson County, Jeriamiah Markee Clark of Sampson County and Roy Lee Hawk of Fayetteville, previously pleaded guilty to four counts of robbery with a dangerous weapon and one count of conspiracy. As part of their plea bargains, they testified against Carr, Colyer said. They are expected to be sentenced in April.